Enjoy The TCP/IP Guide? Get the complete PDF! DNS queries always contain at least one entry in the Question section that specifies what the client in the exchange is trying to find out. These entries are copied to the response message unchanged, for reference on the part of the client if needed. Table 170 and Figure 249 show the format used for each entry in the Question section of a DNS message. Question Name: Contains the object, domain or zone name that is the subject of the query, encoded using standard DNS name notation. 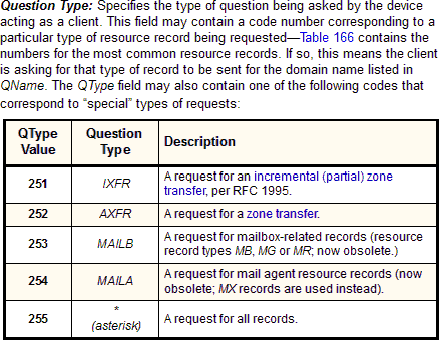 Question Class: Specifies the class of the resource record being requested, normally the value 1 for Internet (IN). See the topic on classes and resource record types for an explanation. In addition, the QClass value 255 is defined to have the special meaning any class.